“You work for just three days in a year?” – a question Singapore GP employees frequently face when meeting well-meaning associates. We chat with key personnel from the race promoter to find out what they do for the rest of the year in the lead up to Asia’s largest sporting and entertainment extravaganza, the Formula 1 Singapore Grand Prix. 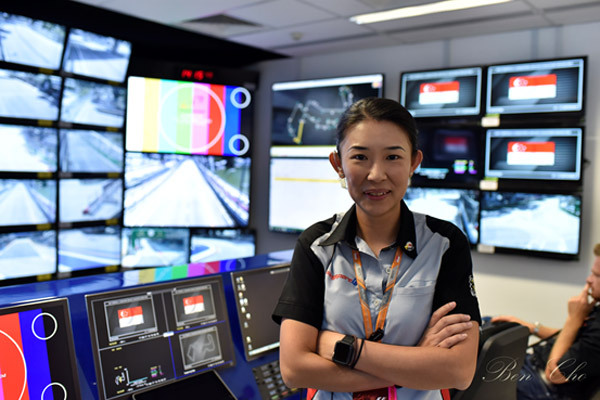 Janette Tan, Senior Manager, Race Operations, is tasked to ensure on-track activities at the Marina Bay Street Circuit are conducted in a safe and sporting manner. Janette has been working on the Formula 1 Singapore Grand Prix since the inaugural race in 2008. 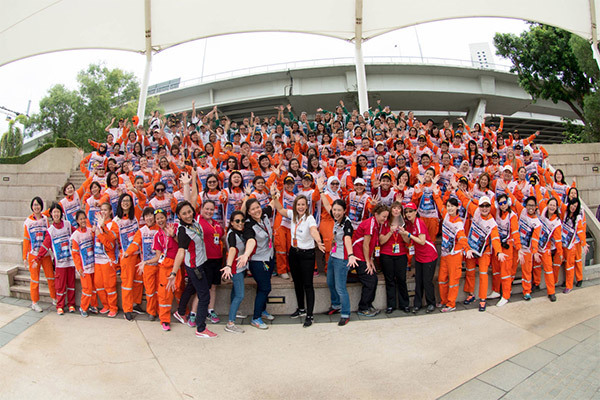 Her team manages over 1,000 volunteer race officials with one of the highest retention rates amongst the Formula 1 circuits. 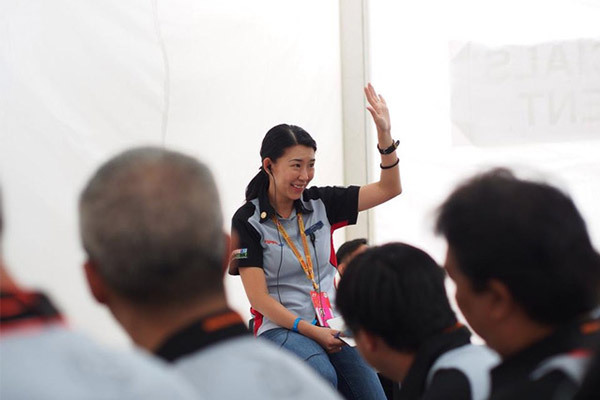 In addition, the busy mother of one represents Singapore in the Federation Internationale de l’Automobile (FIA) and is the General Secretary at Motor Sports Singapore and Chairperson of the Volunteers & Officials Commission. There is no typical day because it varies, depending on the events throughout the year. The Race Operations team officiates at various local motorsports events from February to December. We recruit volunteer race officials in March, and conduct theory-based training sessions from May right through to the race weekend in September. We also have to prepare for the race weekend – basic necessities such as meals, beverages, sunscreen and gloves for the marshals as well as logistical items for the race including tilt-trays, cranes and medical services are procured by June. There are also monthly meetings with the committee and trainers as well as briefing sessions for our senior officials. I am also the point of contact to FIA Formula One Race Director, Charlie Whiting. Hence, I work closely with our technical team and make sure Charlie is kept updated on any changes to the Marina Bay Street Circuit. Over the race weekend, I take on several roles with the help of my team. In addition to being a Volunteer Manager, I am the National Clerk of the Course where I ensure the conduct of support races such as the Porsche Carrera Cup Asia and Ferrari Challenge Asia Pacific are run to the highest standards. During the Formula One sessions, I will deputise the Clerk of the Course. I really like interacting with the race officials. They come from all walks of life and it is interesting to know so many people beyond the officiating aspects. Over the past 10 years, we have cultivated a close-knit family environment amongst the officials. We have seen couples who met at the Singapore Grand Prix, get married and now have three kids! One of our Senior Officials recently received his doctorate and we held a mini celebration for him over the weekend. They are a very fun bunch of people to hang out with and I feel very lucky to be in this job. I also like to enjoy a quiet moment alone at the pit lane at 1am on Sunday morning when the top 10 Formula One qualifiers are completing their weigh-in and checks. It feels surreal that I am actually part of this great event. Time management is extremely crucial. I have a young kid but I count my blessings that I have an understanding mother who helps to care for him when I have to work weekends and late nights. I am very thankful to have friends and family members who are very supportive. What do you look out for when selecting marshals? We keep an eye out for anyone with good volunteering experience. It is not easy to volunteer as a race official and it takes a lot of discipline. Relevant motorsports experience is taken into consideration when selecting an official though not mandatory. Officials must also be able to follow instructions during incident management. What advice would you give to aspiring marshals? Be mentally and physically fit. It is not easy to stand trackside under the humid Singapore weather for 12 hours over 4 consecutive days with very little rest. It can be tempting to give up because of the amount of training you have to attend but when you make it to the end, the satisfaction is endless! Registration is now open for aspiring race officials. We are looking for fire and medical marshals, amongst many other roles that are also available. If you're 18 years and above, physically fit, have a passion for motorsports, can commit to all training sessions and are available from 13 to 16 September, sign up at https://raceofficials.singaporegp.sg by 15 April.